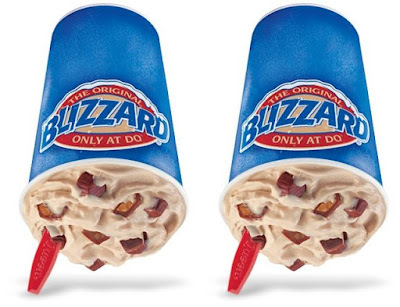 The Triple Truffle Blizzard returns to Dairy Queen as January 2018's Blizzard of the Month. The flavor takes caramel-, fudge-, and peanut butter-filled truffles and mixes them, along with chocolate topping, into vanilla soft serve. It can be found for a limited time at participating locations. The chain has also brought back the A.1. Bacon Cheeseburger as a limited-time entree option for their $5 Buck Lunch deal. The burger features a beef patty, caramelized onions, Swiss cheese, applewood-smoked bacon, and creamy A.1. sauce on a toasted bun. For $5, you can get the burger, fries, a 21-oz drink, and a small sundae.